Your 2018 fantasy football draft may be complete, but we all know that by season’s end, your roster will likely look nothing like it does now. The waiver wire is one of the best things about fantasy, and those who play it right can win their league even if they don’t have the best draft. We’re looking to get ahead of the crowd by highlighting seven players that are going to be hot waiver wire names after Week 1. You might want to consider scooping these players up before everyone else in your league catches on. As of this writing, Powell is owned in under 50 percent of ESPN fantasy leagues. However, PFF Fantasy rankers have Powell as the No. 40 running back in PPR leagues, ahead of more-discussed players like Matt Breida, Ty Montgomery, Adrian Peterson, Ronald Jones, and others. The Jets get the Detroit Lions in Week 1 on Monday night in what will be Sam Darnold’s first start. The Jets could employ a run-heavy approach to ease Darnold into action. It helps that the Lions gave up the third-most fantasy points to opposing running backs last year. Godwin is owned in about one-third of fantasy leagues, but he’s a name everyone is going to know by season’s end. Godwin worked with the first team in the preseason (splitting time with DeSean Jackson) and looks primed to contribute in Tampa from Week 1. This preseason, Godwin caught seven of eight targets for 55 yards and two scores. His 0.48 fantasy points per snap led all Tampa receivers. Mariota has all the tools needed to be a truly elite fantasy quarterback — think top-overall-scorer potential. Mariota went 11-of-18 for 165 yards, two touchdowns, and an interception in an up-and-down preseason (the numbers would have been a lot better if Mariota had hit an open Corey Davis on back-to-back drives in the team’s third preseason game). New Titans head coach Mike Vrabel and new offensive coordinator Matt LaFleur should be able to find creative ways to use Mariota’s athleticism; or at least more creative than Mike Mularkey, who employed a vanilla offense. Mariota is currently owned in fewer than 50 percent of leagues, and he’s going to be one of the highest-upside quarterbacks on the waiver wires to begin the season. This is a purely speculative add fueled by the fact that Le’Veon Bell still hasn’t shown up to Pittsburgh’s practices. Conner would start in Bell’s place in Week 1 and would have must-start fantasy value for as long as Bell sat. Conner was fantastic in the preseason, posting a line of 19-100-1 on the ground (5.3 YPC) while catching all seven passes thrown his way for 61 yards. If he plays in Week 1, everyone in your league is going to be prepping to pick him up within 30 minutes of kickoff. Be the one that gets him early. If you read my bold fantasy football predictions for the 2018 rookies piece, you know I think Miller can put up big numbers as a rookie in Chicago’s new-look offense. Miller’ first test comes on the national stage Sunday night against the Green Bay Packers. The Packers are 7.5-point favorites, which mean Chicago could be throwing the ball often to keep pace with Aaron Rodgers. Miller is owned in only 30 percent of fantasy leagues, and a good performance Sunday Night Football will cause his ownership rate to double (or more). Allison is Green Bay’s No. 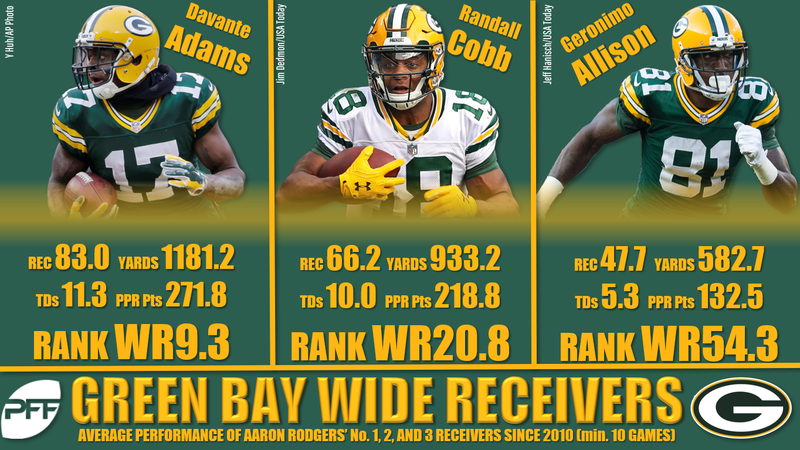 3 wideout leading into the 2018 season, and any wideout who will see a decent amount of playing time on a Rodgers-quarterbacked team needs to be owned in more than nine percent of fantasy leagues (which is where Allison currently sits). Allison was productive with his playing time this preseason, catching five of eight targets for 83 yards and a score. Rodgers has fed three productive fantasy receivers at the same time in the past (Jordy Nelson, Davante Adams, and Randall Cobb), so it’s not out of the realm of possibilities for Allison to become a regular contributor. I’m a big Jack Doyle fan, but there’s no reason Doyle’s ownership should be 90 percent while Ebron’s is only 19 percent, as is currently the case. Ebron dominated in the preseason, catching all nine passes thrown his way for 70 yards and a score. The touchdown came from Andrew Luck in the red zone, which bodes well for Ebron’s usage once the regular season hits. There’s a chance he sees as much playing time as Doyle in Week 1 (Ebron saw 31 snaps in the team’s third preseason game, while Doyle barely saw the field). If Ebron does match Doyle’s playing time, he’ll be a hot waiver wire add by this time next week — especially if he gets more looks near the end zone.